The TVNZ current affairs show Seven Sharp has been criticised this year for dumbing down current affairs. A shake-up of the show is coming in the New Year, with seasoned broadcaster Mike Hoskings to anchor the show when it returns. But while the frivolous banter of the Seven Sharp presenters, social media pop-ups and soft news stories may put some off, Seven Sharp hasn’t abandoned current affairs entirely. Many of its stories are actually quite solidly put together. Take Gill Higgins’ piece in March that imagined a world in 2100 and examined the projected impact of a three degree temperature increase. 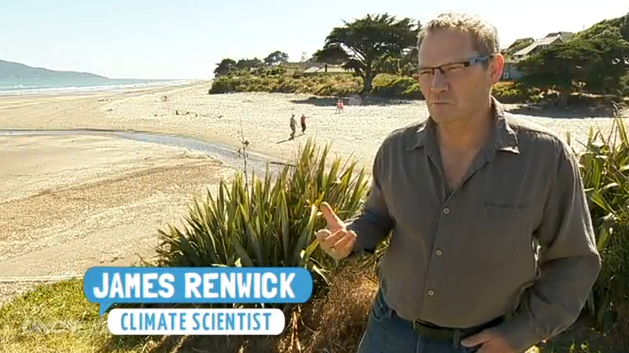 Higgins interviewed Victoria University climate scientist Dr James Renwick on the potential environmental impacts of a three degree increase, while the University of Auckland’s Alistair Woodward, a professor of epidemiology and biostatistics, looked at the potential impacts on human health. All of what they said is backed up by models and research published in the peer reviewed literature. Seven Sharp did quite an innovative treatment of the story, graphically re-imagining Raumati Beach without its beachfront houses and a dairy farm re-cultivated with terraced rice paddy fields. Overall, a pretty informative and entertaining use of five minutes of prime time TV I thought. However, Seven Sharp viewer Mario McMillan wasn’t happy. He complained to TVNZ then to the Broadcasting Standards Authority. These claims were clearly framed as predictions and analysis and sourced to the experts interviewed in the item. Guideline 5a says that the accuracy standard does not apply to statements which are clearly distinguishable as analysis, comment or opinion. The reporter mostly used terms such as ‘could’ and ‘might’ throughout the item and the presenter used open-ended language in the introduction (see paragraph ), indicating that these were theories only, which by their very nature are disputable. …We note that the parties pointed to a range of conflicting research in support of their respective arguments, indicating the complexity of the issue and that climate change is not a black-and-white topic, but one which attracts a wide range of views and a divergence in scientific opinion. In light of this we think it was acceptable for the item to take a deliberately simplistic, light-hearted approach, and to deal solely with the predictions of the scientists referred to. It was presented in an entertaining way, in an attempt to distil one contribution to a complex debate down to basics and to engage with the audience. In our view, given the nature of the programme and the topic reported on, reasonable viewers would have interpreted the predictions with some scepticism. Climate change is a highly contentious issue attracting a wide range of differing opinions, meaning viewers were unlikely to draw any solid conclusions solely from the information presented in the item, particularly taking into account the light-hearted and jovial style of presentation. So because the tone isn’t super-serious, viewers shouldn’t draw any solid conclusions? If that’s the case, we’ve got a bit of a problem in the age of news-lite where the tone is increasingly “light-hearted and jovial”. Just where are news consumers supposed to get information they should take seriously? Isn’t this what we rely on our public broadcaster to deliver in prime time current affairs shows? This sort of logic opens the door for decisions that could just as easily go the way of climate sceptics in future. Heck, its all so complicated, what’s the harm in having the Climate Science Coalition on to explain how the climate scientists don’t really know anything? Viewers can go somewhere else to get the full story! In the Seven Sharp item there was no acknowledgment of any opposing viewpoint. While asking the question, ‘Is it just a sign of things to come?’ the programme presented only the views of the particular experts being reported. There was no acknowledgment that there is disagreement or that there are alternate views. This programme portrayed an unbalanced, and at times, overly simplistic view. That the issue is complex and attracts a wide range of views and a divergence in scientific opinion cannot in my view justify an unbalanced, deliberately simplistic, light-hearted approach. Here again we find a broadcasting standards body struggling to apply the all-important balance requirement to a science story. For climate change, vaccination or mobile phone radiation, the important thing is the balance of evidence. Reflecting that balance is what is important. In the case of climate change, the projections for temperature increase have been endorsed around the world by scientific bodies and by the United Nations’ Intergovernmental Panel on Climate Change. Are they certain to happen? No, but the uncertainty was acknowledged in the piece. …does not agree that the issue of human caused global climate change is a controversial issue. Most governments of the world accept that global climate change is occurring and have taken steps to address the issue. TVNZ made the right call, in my view, in resisting the temptation to go to a climate sceptic token comment about how the models are flawed and the scientists are being alarmist. However, if we turn it around, lets say Seven Sharp does a one-sided interview in a funny, informal way with a climate sceptic. Would the BSA deem this to be okay, because viewers wouldn’t be expected to take it seriously and it should be assumed they can find elsewhere the information endorsed by the vast majority of experts? If that is the case I think we are in for trouble ahead. After all, the BSA can’t rule on the accuracy of the science so can’t really take into account the fact that climate change predictions for 2100 are widely endorsed by scientists and peak bodies. I’m not arguing for false balance – climate scientist given equal time with climate sceptic. I’m arguing for the balance of evidence to be properly reflected. That should be the same no matter what angle the news show is approaching the story from. I didn’t see the piece but I suggest the fundamental problem here is that a five minute piece on a ‘lite’ current affairs programme is not suited to such a topic, due to its complexity, and therein lies the problem: why run the piece at all? There are sceptics who themselves have a balanced view of the issue, it wouldn’t have been necessary to wheel in an uninformed nay sayer, but there simply wasn’t enough time to broadcast a ‘balanced’ piece. I totally agree with your comments regarding the BSA board’s various viewpoints. Finally, I doubt that many of the viewers, interviewed even within minutes of seeing the piece, would have remembered the caveats expressed about the information but they would remember what Raumati beach will, sorry may, look like.